Hell's aquatic Demon Lord of envy. 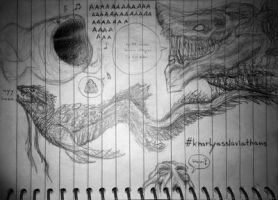 Leviathan, a giant demon that dwells within the lakes, rivers, and oceans in Hell. He migrates from one spot to another by crawling on his armored underbelly. Leviathan can raise his internal temperature to boil the water around him killing anything within proximity. He will also convert internally stored water into steam which is then held under pressure using powerful muscles, and forced out in jets with his lateral siphons, and the many orifices along his body to propel himself with tremendous speed. Leviathan can conceal his surface attacks by creating a thick fog or by temporarily blinding his victims with bright flashes of light. Envy: a feeling of discontent or covetousness with regard to another's advantages, success, possessions and wishes that the other individual lacked it. Leviathan has the ability to restrain/seal/prevent the use of an ability of another being by simply looking at them with piercing eyes as bright as the rays of dawn. In essence he makes it so a being is unable to use a selected power/capability. To get an idea of scale, an average human male is 5 ft. 6 in. and an average Blue Whale = 90 ft.
hey bro, pls don't be mad! i kinda edited this guy. can we talk? Hey there, am I able to contact you to discuss something about this image? epic terror of the deep!! This thing looks like it should appear in Pacific Rim: Uprising! Very cool. Did you look to the Sea Dragon Leviathan for inspiration? Personally I like the massive fins in this design more than the tentacles of the Sea Dragon. He's smaller than the Reaper Leviathan from Subnautica x3 the 112 meter Sea Dragon Leviathan would have him for lunch. Wow, I have this picture in at least one of my Cerulean Seas books foe Pathfinder. Nice to see it on-line as well. i might be able to mod this in-game. all i need is your permission. I don't know where people get the idea that Behemoth and Leviathan are supposed to be demons. In the Hebrew Bible and the Christian Old Testament, Behemoth and Leviathan are described simply as part of God's creation. Fair point. But in the Book of Job, Behemoth and Leviathan are simply described as creatures of might that will not be tamed by the hands of men (paraphrased, yes, but that is the essential gist). And later, in the Book of Isaiah, Leviathan's purpose is stated to be simply: "to frolic". Perhaps I'm missing a passage somewhere? As for this artwork itself, the creature feels ominous and foreboding, and the coloring and shading do well to highlight this aspect. The glowing eyes and the small scale of the human underneath do well to emphasize the sense of power one might feel if one were confronted by a creature of this size. That idea doesn't come from the Bible itself, but from medieval monks and theologians who studied it during the Middle Ages. St. Thomas Aquinas used the Leviathan (along with various other Biblical creatures, such as the Behemoth) to personify the Seven Deadly Sins, with Leviathan representing the sin of Envy. While this does disagree with the Bible, it became widely accepted. This is what the Leviathan in Atlantis: The Lost Empire should've looked like. how did you get the bases for the pic? Do you mean the color bases? If so, I had a very large folder of reference pictures to choose from and kept looking for more, from which to sample from. I sampled a lot of the colors from deep sea fish, sharks, whales, sailfish, etc. for the body form, I mixed a bunch of different animals, sharks, salamanders, dinosaurs. thank you very much, I really wanted something different than the usual serpentine like dragon. It is a very cool design. But I feel like the head and especially the arms make him too humanoid and much less scary. Personally, I would have replaced the arms with a pair of jagged fins, similar to the tail fin and make his mouth longer, with teeth that don't form a closed bite, but instead go between each other. Actually I wanted to stay away from that, because with it being a Demon Lord I wanted it to do more than just act like a beast with an attack limited to only biting. All the main character would need to do is simply get out of the water and walk away. The arms give a lot more range of attack. I'm thinking in terms of gameplay wise. Bye the diver is small enough so that the leviathan won't even bother trying to eat him. If I saw that thing swimming right above me, I would've let my self drown!!! There is no way in hell I'm gonna be able to swim away from that thing, I'd rather die in the water than either it's stomach or it's jaws!!! but it's so damn cool!!! I'm looking forward to some more of your posts! This is just freakin' awesome dude! I honestly love giant monsters. I had a childhood nightmare about a fish that looked similar to this...and at the same scale. Thank you for striking the fear in me just now. this beast is like something i would use in a D&D game as an epic final boss fight! if you were to give your hell leviathan stats what would they be? This thing is beautiful and awe inspiring. Is this going to be part of a seven sins series, or a leviathan\behemoth series? or both?